Six time World Armwrestling Champion Bill Collins, a 20+ year armsport promoter with awards in State, National Armwrestling and World Championships. 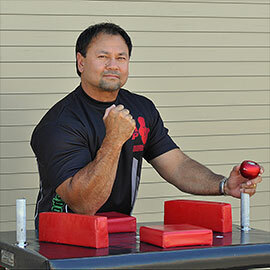 He is a Certified Master Referee for the World Armwrestling Federation and head referee as seen on ESPN2 & FOX Sports. Bill is also a Master and head referee for the United State Armwrestling Federation and has managed the USA Armwrestling team several times. Bill’s currently the Vice president of the United State Armwrestling federation, Founder of National Armwrestling promotions, Co-founder of the Ultimate Armwrestling League and has hosted over 275 events in addition to hosting the largest Championship in North America with over 1,350 competitors, represented by 42 countries. Armwrestling is not the bar room sport as it’s been perceived. Bill and his partner Robert Drenk (The Ultimate Armwrestling league) objective is to main stream armwrestling in the USA and legitimize armwrestling as a professional sport. Armwrestling is the oldest sport on this earth, the fastest sport on this earth and everyone has done it at least once in their life. Speed, technique, power and strategy are key elements to become an elite armwrestlers, which includes fast spontaneous split second decisions. It’s small, it’s portable and it’s powerful and after using the V-Gyro for a short period of time, every part of my arm is on fire, it’s a piece of equipment that can be used in your office or at breaks, it’s the one stop shop in the palm of your hand…A total forearm, wrest and hand work out and I can work out the weaker parts of my forearm or hand, with rotating my hand position. These gyro’s pack a punch and from one champion to another the DFX products are a must if you want to achieve ultimate gains..